19 October 2015 -- Queen Nanny was one of the first feminists in the new world. A legendary chieftainess of the Jamaican Maroons, Queen Nanny cast aside the chains that bound her as a slave and the traditional role that had been expected of women in the 18th century to lead her people to victory over the mighty British army. 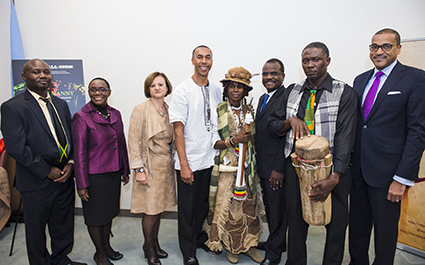 Her story of great courage and military genius was revealed at the world premiere screening of Queen Nanny: Legendary Maroon Chieftainess held on Monday 19 October, 2015 at United Nations Headquarters in New York. This one-hour documentary film unearths the mysterious figure -Queen Nanny- and tells the story of the Jamaican Maroons’ struggle for freedom. It also examines Queen Nanny’s legacy and her impact on contemporary women in general, with appearances by Jamaica’s current Prime Minister, The Most Hon. Portia Simpson-Miller, double Olympic sprint champion Shelley Ann Fraser-Pryce, Congresswoman Yvette Clarke and her mom, former Councilmember Hon. Una Clarke who attended the screening and the “Queen of Reggae” Rita Marley (wife of Bob Marley) who was also in attendance. 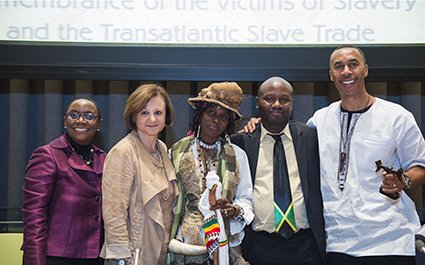 Organized by the United Nations Department of Public Information's Remember Slavery Programme, in partnership with the Permanent Mission of Jamaica to the United Nations and the Permanent Mission of the Republic of Trinidad and Tobago to the United Nations, this film shed a light on the experience of women and slavery, and the United Nations International Decade for People of African Descent (2015-2024). In explaining how this film relates to the objectives of the Decade – Recognition, Justice and Development, Gaynel Curry Gender and Women’s Rights Advisor for the United Nations Office of the High Commissioner for Human Rights, indicated that the very fact that few people know of this great woman’s achievements is evidence that women have not been given the recognition that they so rightly deserve. Justice for women, especially women of colour, has also not been served. Ms. Curry cited several causes for this: inadequate laws, policies, practices and traditions that discriminate against women; lack of access to information and participation; exclusion from decision-making positions and the absence of effective remedies. “Despite the proven benefits of ensuring women’s access to productive resources, women, particularly women of African Descent, still experience considerable discrimination in the area of development,” she said. The screening was followed by a discussion moderated by Ms. Cristina Gallach, United Nations Under-Secretary-General for Communications and Public Information. The panellists included: Roy T. Anderson, director, producer and writer of the film; Dr. Harcourt Fuller, producer and historian on Africa and the African Diaspora at Georgia State University; Gloria Simms, lead actress and Gaynel Curry, Gender and Women’s Rights Advisor for the United Nations Office of the High Commissioner for Human Rights.